No matter what the temperature might be outside, the two-stage S8X2 gas furnace is designed to provide a consistent, predictable flow of warm air to keep your family comfortable all winter long. 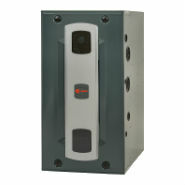 The single-stage S8X1 gas furnace is a good choice for those looking for solid heating. Tested, durable components help make sure your system is at optimum performance. The single-stage XB80 heating furnace is designed to help meet your family's needs, year after year. Because a Trane XB80 furnace is built to last, your family gets the benefits, consistently.